This level has medium difficulty. 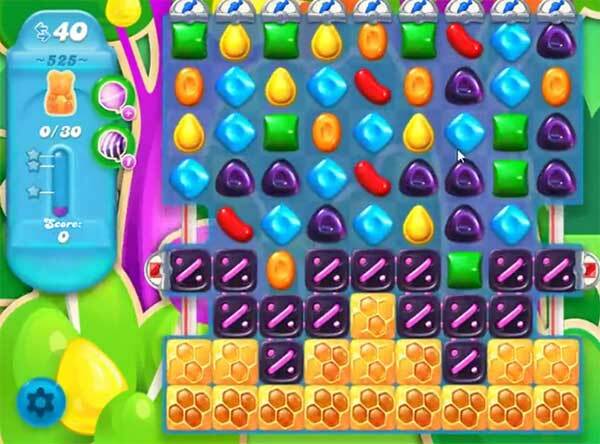 For this level try to play near to the bottom part of the board or try to make special candy from the purple candy to get more special candy. Or play near to honey blocker to eat them to save the bears. My husband cleared level 525 but it wouldnt let him go to next level , some litte thing said “caint leave without your paints and popcorn” what does that mean? hi I cleared level 525 but it wouldn’t let him go to next level , some litte thing said “cant leave without your paints and popcorn” what does that mean? I am a novice and did it! I need help to complete this level!! I am sick of looking at this crazy level. PLEASE get me off of it. I know you control the board and being a good player is not part of it. I have wasted my extra boosters and it didn’t even help me collect any more bears than not using anything but my own luck to pass this level. I can’t get pass this level 525 Candy Crush Soda. I have been on this level for over 3 months. I am thinking give up and delete the game off my computer. Can anyone help me? Thank you in advance.